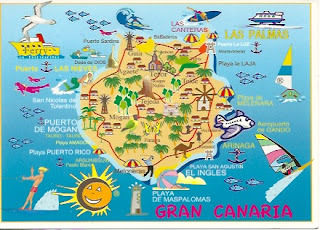 Atlantic Ocean-Canary Islands-Gran Canaria-Playa del Ingles. I always enjoy map cards. This one shows Gran Canaria which I have been to many times. Nice for a winter break . Many have the post offices in Spain have no choice of stamps and will try sell you a pack of definitive stamps. Got all these stamps when I was in Tenerife as there was a Head Post Office there. Postmark is Last Palmas even though posted in Playa del Ingles.